I shoot vintage vans, especially old camper vans, for obvious reasons. This extended length Maxivan with a high roof is as close as it gets to my ProMaster in configuration. Maybe I should have just looked for one of these? No thanks; I’m too spoiled by the way the ProMaster runs. But let’s take a look at this ancestor. I’m struggling to make sense of the faded lettering. 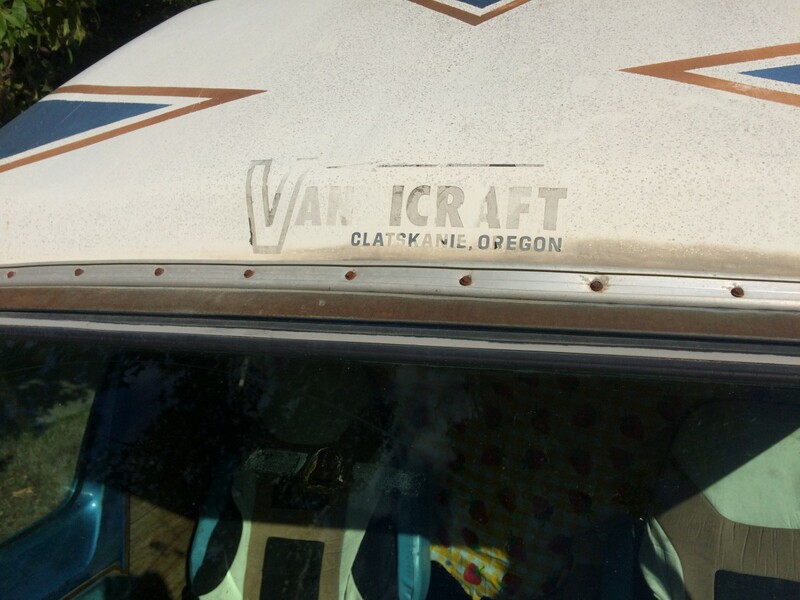 I get the “VAN” and “CRAFT” part, but how does the “I” fit into its name? It’s a local product, which is not surprising. 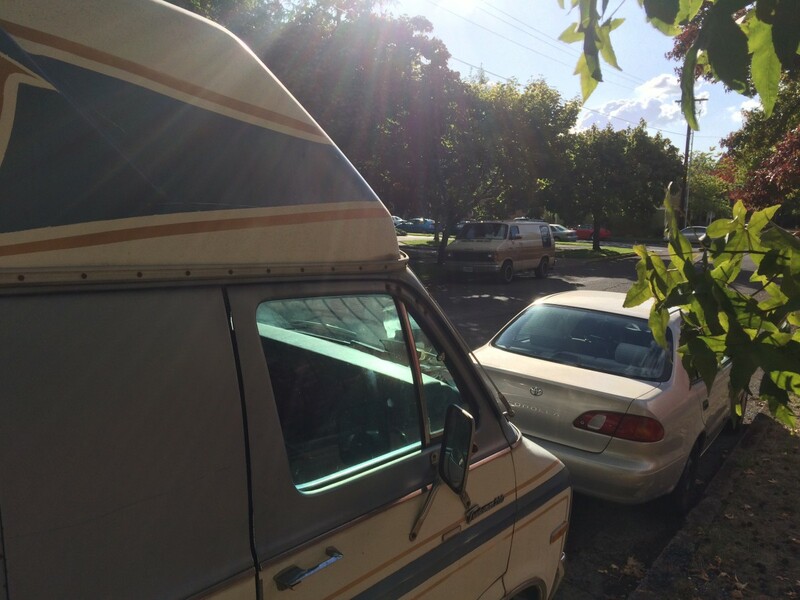 There were a number of RV companies based in Oregon, and nearby Junction City was once a hub for several manufacturers in more recent years, but the last great recession wiped them out. Now the industry is almost totally clustered around Elkhart, IN. 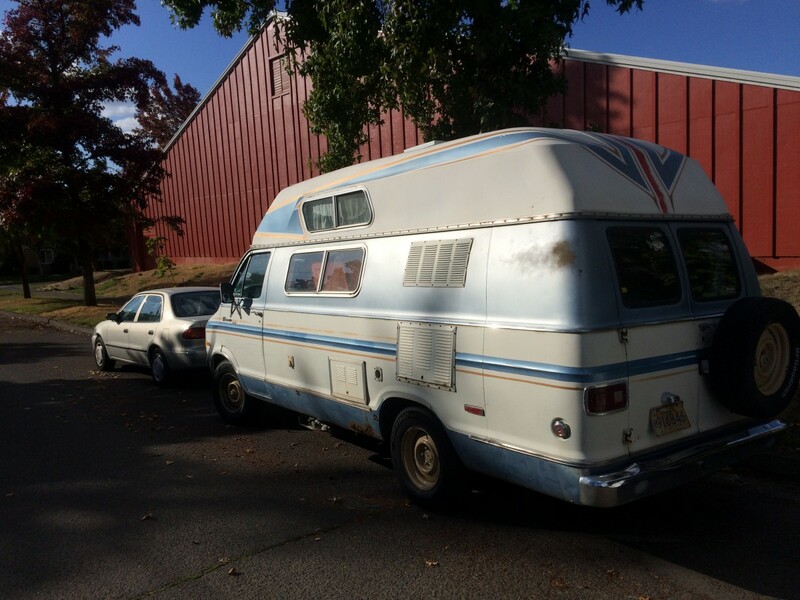 Ah yes, this looks familiar, having spent some 25k miles in our ’77 Dodge Chinook. 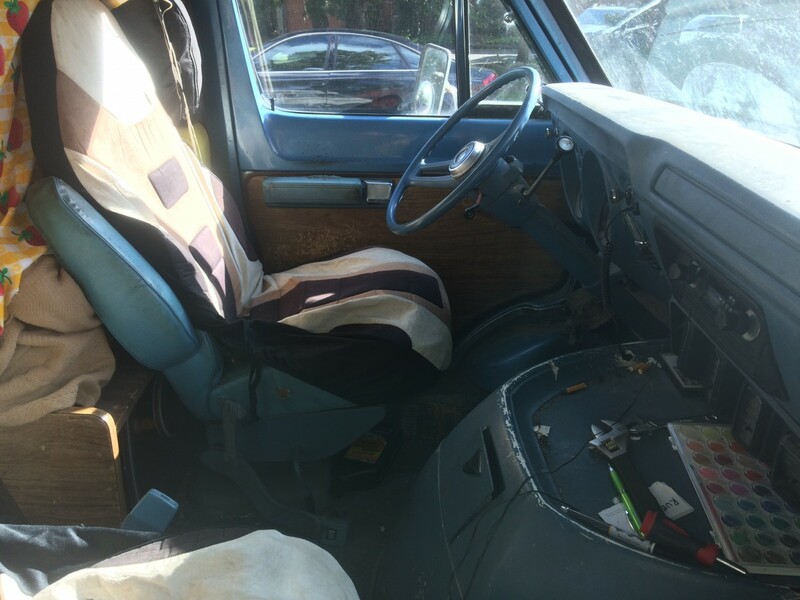 The steering wheel is a bit different; maybe this is a ’76. I do not miss that giant, hot, noisy engine dog house. The Promaster’s little V6 is completely out of sight in front of and below the high cabin, with a flat floor from door to door. What’s a bit surprising is that this is a B200, not a proper 3/4 ton B300. It’s got the five lug wheels to prove it. Seems like it would easily be pushing its rated capacity with full fluids and gear and a case or two of beer or wine. Speaking of, this wheel style is what led me to say that that Dodge pickup we looked at the other day had factory 16″ wheels, as they are very similar in appearance and both have that distinctly small ridge and nubs to attach the little Mopar dog dish hubcaps. The Dodge vans were hugely popular for conversions, and the extended length Maxivan was in a league of its own. And their basic ruggedness means there’s still a few around. As in another one right across the street. But that’s a shorty, and a whole different type of conversion van. We’ll look at it another day. It’s pretty hard to beat the ruggedness of these old Dodge vans. When my company was just starting out, we had two of them. Both hauled a huge amount of stuff. Now we have moved on to more modern, larger vehicles, but those two Dodge vans is were it all started. 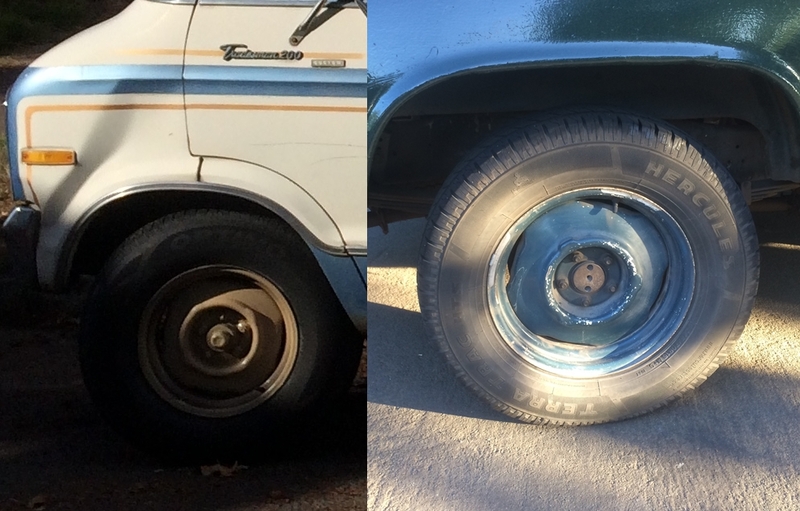 In this era Dodge and GM “3/4 ton” vans were just the 1/2 ton van with a little stiffer spring, and they had a actual capacity that was about the same as Ford’s E-150. 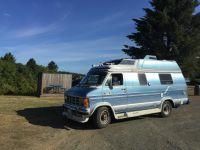 Ford was the only one who used 8 lugs and a full floating rear axle on their 3/4 ton vans, though by the 80’s and early 90’s there were semi-floating rear axles in the E250’s though again they still had 8 lugs and the larger brakes shared with their 3/4 ton pickups. The high top on that one looks to have came from the same mfg as the one on my old 82 E150. Since it started life as a wheel chair lift van it did have extended height slider, but not a full interior build out so the 1/2 ton Ford chassis was sufficient. But for this I agree that they should have went with the “1 ton” 300. Yes, the “x/x ton” nomenclature was a bit less than precise. But there was of course the B300 version, and that was common enough. I guess that would be referred to as a one ton, although in reality it probably mirrored the 3/4 ton Dodge pickup in its suspension, axles and brakes. Yes the Dodge 300 and GM 30 “1 ton” vans used the same brakes as their 200/20 3/4 ton trucks and similar if not identical rear axles. Heck, most G20 “3/4 ton” vans I’ve seen used the 5-lug axles common to half-ton 4×2 pickups and vans. In terms of GVWR, both the B300 and the G30 were heavy 3/4 tons at the time, with ratings of 7700-8000 lbs., similar to the Econoline 250. By today’s standards, they’d all be “half-tons” in Class 2A with the F-150 and Ram 1500. The G30 cutaway and chassis cab models, as well as Dodge’s cutaways sold as “Kary Vans” were proper “one-tons,” with 10,000 lbs. GVWR as was expected of the time. Here’s the spec sheet on Dodge ’78 vans. There was some variation on GVW depending on rear springs and/or axle within the three general categories. The uprated B200 has a GVW of 6400, which seems reasonably adequate for the job here, although the rear does seem to be drooping some. Yes the 200/20 vans, had the same 5 lug brakes as the 100/10 vans and 100/10 Pickups of their respective manufactures. 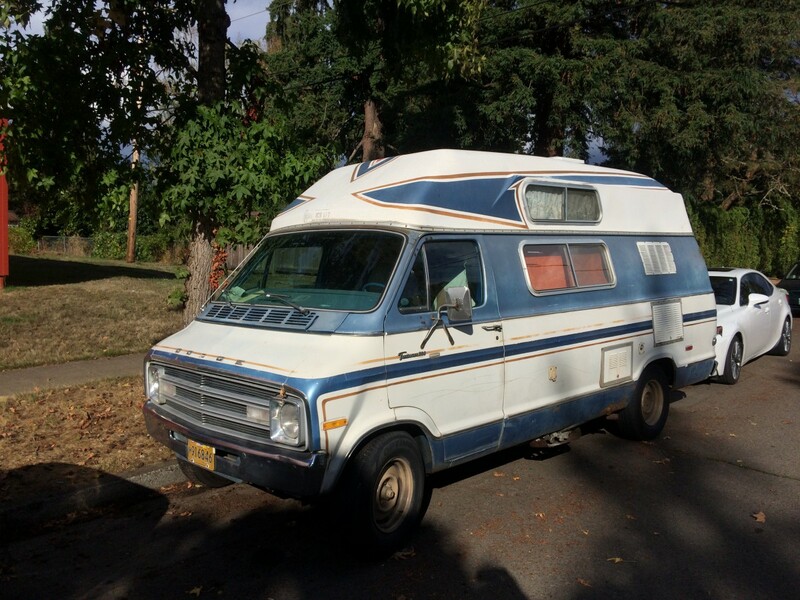 Here is the Ford from 1975 the year I found with the nice GVW chart, but it is nice because the E-100 was still on the market and it lines up the best with the 100/10 vans while the E150 is closer to the ranges of the 200/20 vans. And GM’s from the same era. Some of that GVW inflation was thanks to the regulations. In 1975 you could avoid the catalytic converter at an “over 6000lb” GVW which brought us the “heavy half” trucks that eventually displaced the previous standard 1/2 tons as the loophole was tightened. However that only encouraged the GVWs of the “3/4 ton” trucks to rise also. The last of the E-150’s have a minimum GVW of 8520 to stay out of the CAFE pool and the E-250 would only get you and extra 40 lbs of GVW. Both have 8 lug semifloating axles. Of course rising curb weights thanks to added features account for some of the increase in GVWs but Payloads have also increased significantly over the years with my 06 F-250 having a higher capacity than my 84 SRW F-350. WRT to the ruggedness of the Dodge vans: When I was in college, I worked summers and holidays for a grocery distributor, at that time they had their own fleet of trucks (COE day cabs mostly). I was a Teamster, but due to their unique contract with the union, the company could rotate the younger (newer) workers in different positions throughout the business. If things were slow on the loading dock, I could be cleaning toilets or working in the shop with the fleet mechanics. The shop had two Maxi-vans with all of the stuff you’d need to get a truck up and running again. IIRC, we never went more than 100 miles from our shop to rescue a power unit, but the company didn’t distribute much more than a 100 mile radius anyway. I got to go on a couple of those runs and was amazed at what those Maxi-vans could haul and how quickly they could do it. I’ve been a fan ever since. I love these old style Dodge campers. I have fantasies of buying one from a dry state (out West), re-doing the mechanicals and enjoying the life that the Not-Denzingers (similar to the Not-Niedermeyers) never enjoyed back in the day. But reality sets in. Even if I could find a dry-state chassis, rebuilding/replacing the running gear and getting the living quarters into shape, would probably equal out to buying a new one instead. Ugh. 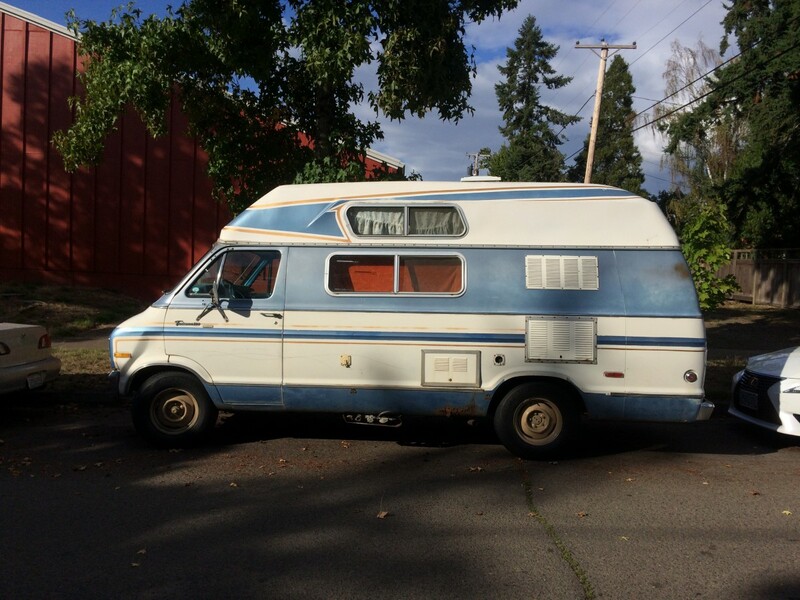 Any 1970s Dodge camper van will always make me think of Uncle Rico from the film Napoleon Dynamite. Which is to say, this van is flippin’ sweet! I wonder if factory-available high-roof vans from Ford and Ram is damaging to the manufacturers of fiberglass high roof conversions. The availability of high-roof vans does seem to be changing the landscape in Class B RVs and also the conversion shuttle bus market. I’d say it is killing it and rather quickly as GM is the only one that doesn’t offer a factory high roof, or two, of all full size vans available in the US. And that factory availability has caused the percentage of high roof vans to skyrocket. Probably right. Although there are still Chevy/GMC fans, and they are also making high roofs for Transit Connect and possibly ProMaster City. Wow, I can’t believe they still show pictures that seem to indicate they will still make you one for your Aerostar, Astro and other vans long out of production. I guess if you have the space to store the molds you can dig em out and make it if someone wants it. They are going to be done one by one, so it really doesn’t make much difference which mold they are using. What catches my eye is the retro futuristic furniture, in their other category. Another admitted fan of these old Dodges, here. I think that if you would look behind the full-width horn pad on your van you would see this steering wheel. I remember this as the basic wheel in Dodge pickups and vans in the early and mid 70s, one that was made to look completely different with the full-width horn pad that is in yours (and was in the 73 that my good friend’s father drove). There’s no less than two of these vans running around in the area I live in. They are slightly newer, having the square headlights, but otherwise look very similar, including the white-and-blue paint scheme. I see both somewhat regularly, at least in the summer as I suspect they get stored in the winter or get driven to a less salty climate. For a while I only thought there was one around, until I noticed that one of them has a roof-mounted A/C unit and the other does not. 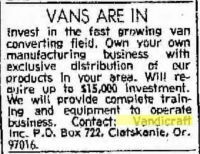 My sister lives in Clatskanie (accent on the first syllable, last syllable rhymes with “sigh”) and I’ve asked her if she knew about the vans, or the van-man’s quail farm. Mom has a very similar unit,a Westerner, built on a 1986 B250. 15inch five lug rims an 225R15 tires, but it seems to have done fine. She doesnt drive anymore but refuses to sell. Too many good memories just seeing it behind the house. Great timing. Just picked up this 1990 L.E.R. Industries conversion with 68k on it. Should be a pretty straightforward project. It fired right up after sitting for 5 years. Been looking for the right one for years.